We couldn't be happier to announce our partnership with longtime friends Kinderhook Farm in Valatie, NY! They raise what is known internationally as the benchmark for highest quality 100% Grass Fed, Grass Finished Beef. 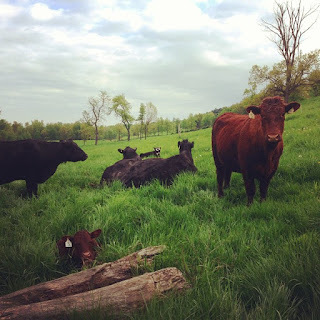 This sustainable farm carries Animal Welfare Approved Certification for their Black Angus and Red Devon Breeds of cattle, and will be available for the first time ever in The Pioneer Valley; fresh, never frozen, and cut to order by yours truly! We are offering sides (approx. 350 lbs. each) of Kinderhook Farm Beef custom cut and vacuum packaged to your specifications for $7/lb. hanging weight. That's a savings of over 50% off of the retail price of an equivalent amount of beef purchased in store or on their farm. Please email us at butcher@suttermeats.com if you are interested and we will send you a fully customizable beef cut sheet. More information about Kinderhook Farm's 100% Grass Fed, Grass Finished Beef can be found here.